I love the light of this picture and the movement around the girl. Beautiful!!! Beautiful light! Stunning textbook photo! Wowww, Cruella De Ville, and she looks good, too! Love this shot, the shadows are stunning, especially in contrast with her blonde, blonde hair. Beautiful. I must say, I’m really digging the storytelling in these new portraits. the lighting is so good in this shot, it makes it. I have to say that the pictures in this blog are getting better and better! Theese last few days… amazing! The lightness in this photo is perfect! Totally focused on the main subject! Love this shot. Cool to see you use more direct, harsh lighting and still rock it. Oh, the natural light spotlighting her is phenomenal! All the more for her style to stand out. The composition of the photograph is every bit as interesting as the young lady. It’s almost like one angel ready disappear ! So clear vibs ! fantastic look with the coat! great shot! alone in a crowd, has something fascinating! Love that she stands out, great composition and lighting! She looks like a 1980′s hybrid of Cyndi Lauper, Madonna and Debbie Harry…gotta love it! I have a similar coat and love it. Like the wider angle shots you’ve been taking lately. The backgrounds are as interesting as the subject matter. Like a still from a movie set. Love it. this is one of those photos that makes me want to move to New York. Love the Style from New York! Real or faux? Doesn’t matter to the styling of this gorgeous fur coat. I know some of you are going to retaliate and think I’m so stupid for saying this, but I have to say it anyways… WHAT’S WITH ALL THE FUR? Aren’t we past this phase in society yet? I’m not saying we need to go throw a bucket of red paint on this girl, but why are we promoting this look? I’m only saying this because the past few months on The Sartorialist has shown A LOT of fur. Have we seriously forgotten about the killing that goes on to create this look? It’s not like it’s a cow hide taken from an animal used for food production. It’s an animal killed solely for its pelt. Even if the clothing uses faux fur, it still glamorizes the look which then influences others to desire it for themselves. We need to eliminiate the demand for fur in fashion. I am not an expert and I’m sure this post will be torn apart but I just wanted to make a point. I think The Sartorialist can do without the fur. Jessica stole her great-aunt Berta’s coat from the downstairs closet. It was the one she had last seen her wear at the school play. The one where she said “Jess, you have the makings of a star, love.” So Jess knew she wouldn’t be too cross. Her mother on the other hand would have a cow. But that’s that. She couldn’t go back now. Jess caught the train to grand central station and the subway to 14th street and looked around for Andy Warhol. Or whichever glam hipster dude thought he was the next Andy. Berta’s coat worked like a charm. Suddenly a photographer’s lens shone in the spring sunshine. She posed, unsmiling. Oozing hope and attitude and an internal plea for glory. Beautiful picture, I really love it! She reminded me Luna Lovegood from Harry Potter. Crystal-should we also refrain from wearing an animal print blouse or skirt made out of cotton, poly or silk, as well? After all, those too, would “glamourize the look”. This image reminds me of Joel Meyerowitz’s street photography shots. I especially love his with the two people in yellow coats walking through steam. Also the one where a man has fallen near a subway stairwell. Your work has really taken a turn and I am enjoying watching your progression and how you include more of the surroundings – fashionable or no. Her confidence radiates throughout this shot – a great look! Stella Rose Saint Claire, looking good gurl!! The lady’s outfit on the right is not bad at all! Love it too! Nb: I rarely see any pics taken in London! What does that indicate in terms of street style? Stella is a vegan. Her fur coat isn’t real. Chill out! She looks gorgeous. Crystal: the subject is actually a vegan, and the coat is, in fact, faux. Can’t faux fur increase demand for OTHER faux fur? I m in love with the light of this picture! WOW…like a film….amazing photo!! brilla tra la gente anonima!! I miss New York, already! 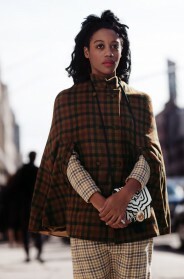 And the new yorkers’ style is amzing! Love that coat. Very cool, she looks like an artist. Great photo too, it looks like a styled photoshoot. Such a beautiful picture! I love all of the activity around her and the lighting on just her. It couldn’t have been more perfect! Very interesting picture, feel like the world is surrounding her. Always a great street for some interesting shots! I have great respect for your work Scott. These series of shots with the lighting is a technique only those who know the nooks of the city through and through. Again a wonderful image, the highlight is unmistakeably breathtaking. Is her bag leopard printed as well? Leopard fur coat … wonderful!!!! Gorgeous. The coat is a classic. The swing style leopard can go with anything, and she proves it. And I doubt its real, but even if it is, thats not our concern. Theres a lot more harmful things humans do to animals then raise them for fur. Like the overpopulation that drives them out of habitats to extinction. So considering that a person that has no children but eats meat and wears fur is far better for the environment, why don’t we not throw stones at each other. Its hypocritical. really enjoying your past few distance shots. a nice whirling, dreamy context. your stationary subject and the moving world. Love the way she channels icons like those mentioned in the comments–Debbie Harry, Cyndi Lauper, Cindy Sherman–yet looks entirely like herself. Also love the fake fur. 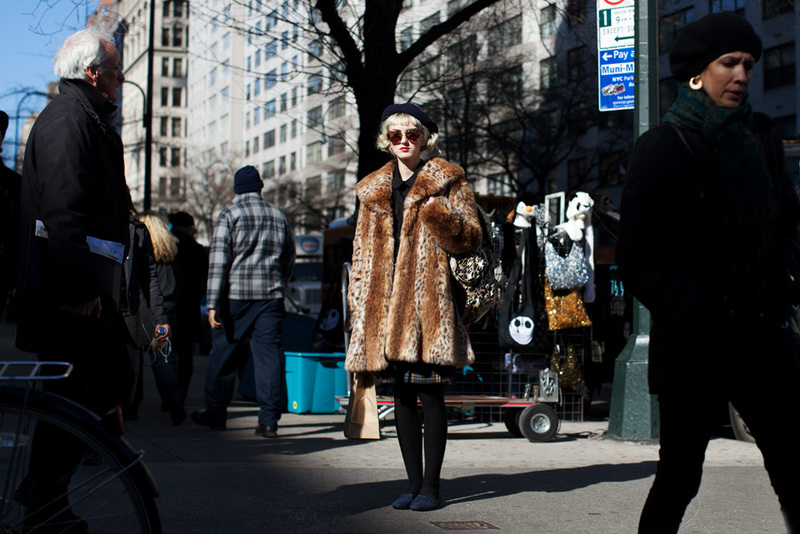 Like Crystal, I too got very tired of the parade of fur in the winter photos, but I think that faux fur is great. It can be very warm & it often looks great, and as such it makes people who still buy non-vintage real fur look silly and painfully behind the curve. This whole outfit is wonderful. Every piece works so well together and she looks so complete. That is true style, in my eyes. The photography is also absolutely stunning. Looking lovely Stella! I love you!! Fur happy makes me happy!!!!! this woman is literally standing in the spotlight in her fur! is it just me or does it age her a little? perfect capture! Love the coat! She pulls it off well!